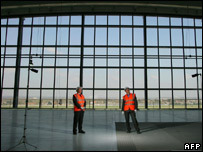 The first thing that strikes you is its size: the main Terminal 5 building is big enough to house ten football pitches. The whole Terminal 5 complex, including two satellite terminals and stands for 60 aircraft, cover an area the size of Hyde Park in London. But then it needs to be big. It is designed to take 30 million of the 68 million passengers who pass through Heathrow each year. The airport's present terminals were designed for, at most, 50 million and are now hopelessly congested and chaotic, dingy and dysfunctional. 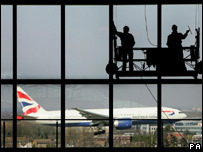 Terminal 5 will become the hub for almost all BA flights from Heathrow. Its opening will allow space to breathe for airlines and passengers at the remaining terminals. And there are plans to knock down and redevelop the oldest, Terminal 2. 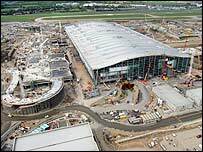 The second thing that strikes you about Terminal 5 is that some bits of it are still a building site while others are virtually complete. At the south end of the main terminal building the departure gates are finished. Only those rows of plastic seats and electronic signs hanging from the ceiling seem to be missing. Elsewhere fork lift trucks shuttle back and forth and the noise of hammering and heavy machinery is almost deafening. Crowds of men (and the odd woman) in hard hats swarm like ants through every corner of the vast building. Most impressive is the check-in area, on the top floor beneath the huge roof. A clear single-span structure that rests on 22 massive steel legs. This is where passengers will arrive to check-in at self-service machines and leave their bags at one of 94 baggage drops. Next to each drop, rows of suitcases are lined up, recycled from the orphaned bags lost at Heathrow over the years and never reclaimed. Earnest young men with laptops are preparing to test the system, which in theory can process up to 12,000 bags an hour. Passengers are promised a seamless, almost queue-free passage through check-in to passport control and the security area (enlarged after last year's terrorist scares). BAA officials seem confident they can deliver on the promise, and standing beneath that spectacular roof, designed by the Richard Rogers Partnership, you really want to believe them. Once in the departure lounge, passengers will have over 140 shops to choose from, right next to the departure gates. Gone are those long walks from the main lounge to the gate which are a tedious feature of Heathrow's existing terminals. Just visible through Terminal 5's grimy windows (they'll soon start to clean them) is the first of two satellite terminals linked to the main building by an underground shuttle. It's hard not to be impressed, by a building that should make travelling to Heathrow less of an ordeal for millions of passengers. But not everyone is delighted. Already the environmentalists are marshalling their forces for the battle over another BAA project: the scheme to build a third runway and a sixth terminal at Britain's busiest airport.